The Huskies got a glimpse of the future in the fourth quarter of Saturday’s 45-3 rout of North Dakota. And it looked pretty perfect. Redshirt freshman quarterback Jake Haener was 7-for-7 for 110 yards and a touchdown in his debut for Washington on Saturday at Husky Stadium. His first collegiate touchdown pass went to his friend, sophomore receiver Ty Jones, who made a terrific one-handed grab along the right edge of the end zone. Last week, Haener prepared knowing there was a good chance he would play against an FCS opponent, and he said he will continue to push senior QB Jake Browning in practice. “I prepare every week like I’m the guy and try to be as ready as I can if anything happens to Jake — just do everything I can to be ready for the team and take advantage of my opportunities,” Haener said. He was asked about his relationship with Browning. “Early on when I first got here, I was looking to him more for him, being by him and trying to absorb as much as I could,” Haener said. “As I’ve gotten older, I’ve tried to not bother him as much or be in his ear 24/7; eventually you’ve got to figure things out on your own and grow into the player and person you want to be. So he’s been there and we help each other out, and we’re both side by side. It’s not like he’s super old and I’m way down there with no idea what’s going on. We both aim to help each other. 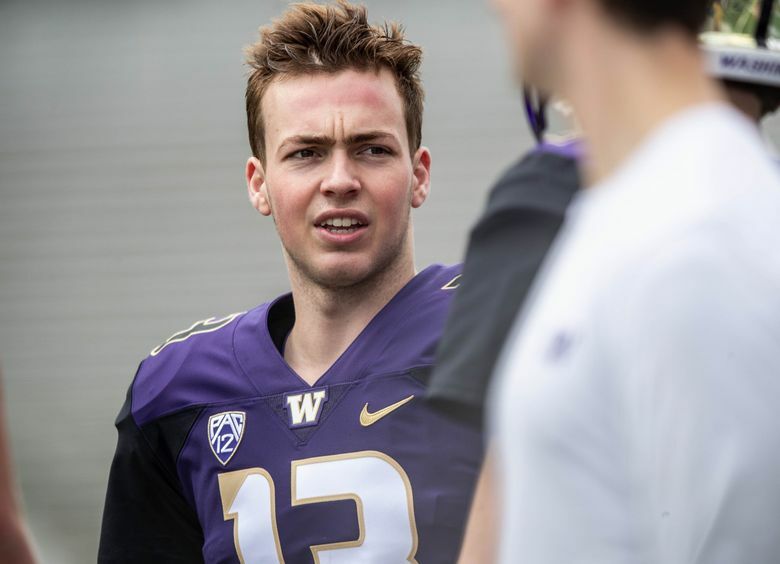 The Huskies are as deep and talented at quarterback as they’ve ever been, with Browning and Haener backed up by true freshmen Jacob Sirmon and Colson Yankoff. Former five-star recruit Jacob Eason is sitting out this season after transferring from Georgia.